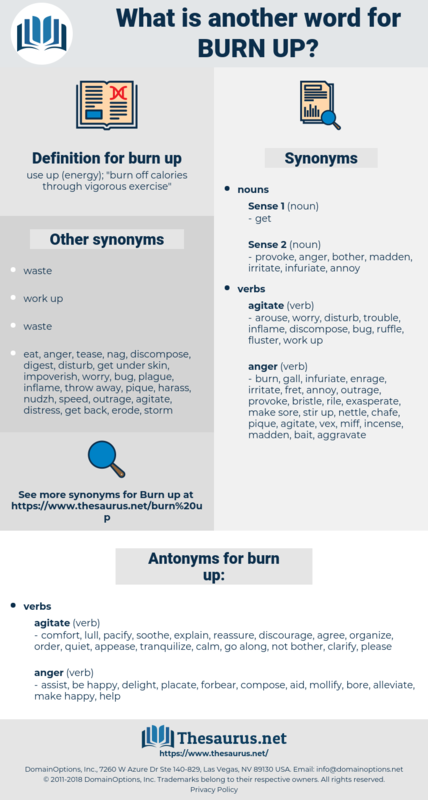 What is another word for burn up? 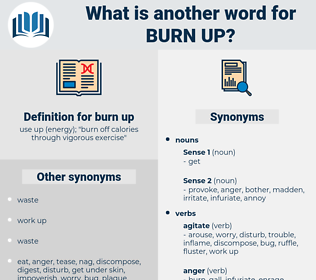 use up ( energy); " burn off calories through vigorous exercise"
comfort, lull, pacify, soothe, explain, reassure, discourage, agree, organize, order, quiet, appease, tranquilize, calm, go along, not bother, clarify, please. assist, be happy, delight, placate, forbear, compose, aid, mollify, bore, alleviate, make happy, help. cheer, charm, gratify, support, enchant. appear, hoard, gather, collect, build, starve, accumulate, save. dissuade, relieve, heal, neglect, hide, gladden, assuage, mend, fix, cure, leave alone, ignore. sort, arrange, encourage, locate, exhilarate, enlighten, clear up. dampen, put out, extinguish, dull, disenchant, turn off, blunt, stop. treat well, compliment, honor, satisfy, sanctify, praise, flatter. freeze, bloom, moisten, wet, grow. fill, develop, succeed, improve, raise, strengthen, preserve, increase, rise, maintain, create.